Here be Monsters! They lurk and crawl and fly in the shadows of our mind. We know them from ancient legends and tales whispered by the campfire. They hide under the dark bridge, in the deep woods or out on the great plains, in the drizzling rain forest or out on the foggy moor, benath the surface, under your bed. They don’t sparkle or have any interest in us except to tear us apart. They are the monsters! Forgotten, unknown, misunderstood, overused, watered down. We adore them still. We want to give them a renaissance, to re-establish their dark reputation, to give them a comeback, let the world know of their real terror. When I was a young womble my library had several shelves devoted to the myths and legends. Not simply the ancient gods of Greece but English folklore and other such stories. As a child I never really understood that tales and stories were actually a worldwide tradition and those stories perhaps told us even more about ourselves than we thought. 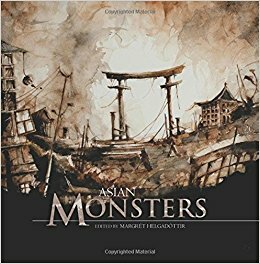 Fox Spirit Books has stated a project to bring authors from around the globe to tell stories relating to particular parts of the world and while each tale is focused on one particular monster there is a huge variety in approaches and even formats. A young boy livs on Ghost Street. He may indeed be the only living boy in the entire street but what are his friends and carers hiding from him? A book with subtle clues that there is more going on than you expect and the community of ghosts we see is fascinating even as they celebrate ‘life’ in parades and masks. An evil monster is starting to kill people it’s a fearsome water monster known as a lelpah. Two young children try to work out is it purely a wild monster or is there an agenda in it’s choice of victims. Are monsters capable of morality or is it merely a disguise for convenience. Darkly unsettling. A young woman fearing that her imminent marriage will end up for convenience decides help from an old relative is the only solution. That here relative will mean raising from the dead leads to unexpected consequences. The ghost is not the most terrible thing here as it examines the concept of foot-binding used to make wives more attractive to their husbands. At the same time a ghost realises as she is outside of the world she also now has her own freedom. Sensual, dark and disturbing. A young woman finds a baby that gives her immense joy. However, her neighbours and family start to suspect something is not quite right. Told in small flashbacks this is a tale of madness and as the reader puts the clues together we see a mother’s love is a terrible thing when threatened. This graphic novel short sees a band of magical adventurers track down the ghost of a local Prime Minister. The art sizzles with action and really flows! I would love to have known more about the master and his young student who go into battle. This again reminds us not all monsters are supernatural. A young woman hurt by a previous love has started a relationship with an older man who seems to see her increasingly as a trophy and a possession. But their trip to a bath-house and the kind old lady looking after them soon leads to judgement. Our young narrator’s life to date is really made alive and it’s a reminder that ghosts while horrible don’t always focus on the innocent. A young woman enters a private residential area to take pictures of owls. But she swiftly finds there is a bigger predator out there and it’s got a clear idea of who it needs to find. That sense of being watched in the shadows is really strong here but balanced with a modern setting and ultimately, we find family secrets that perhaps have brought this on themselves. The reader gets to judge who is the real monster. A young woman is trying to support her child alone by working as a family babysitter. On the day she finds her mother is very sick she also starts to find her local family is being stalked in the city by a blood sucking monster. In this case it’s a horrific version of cat and mouse in which Patricia our babysitter must battle a monster that the quieter it gets the closer it is... I like the way an ancient evil has been placed into a modern city again and the action sequences and build of tension made this one of my absolute faves. It is an excellently balanced collection giving me a feast of new authors to find and I really am looking to the complete series. Excellently put together by Helgadottir and the stories all have some beautifully dark illustrations to give you an extra sense of terror! Well worth your time and slight urge to lock the doors at night!